The CEO may be gone, but one critical problem area persists. There have been grumblings about Costolo's leadership before, and a telling look into Wall Street's mind occurred when a rumor that Costolo was leaving last month was accompanied by a huge spike in volume and price. And just like then, Twitter's shares zoomed up as much as 10% in the after-hours markets after the announcement. Perhaps the most damning turn of events from those rumors and the current removal was a long open letter from large investor Chris Sacca entitled, "What Twitter Can Be." While the letter is mostly complimentary of Costolo and the overall executive team, Sacca faults leadership for "failing to tell its own story to investors and users," a relatively strong criticism for a company's C-suite even when couched within a complimentary article. 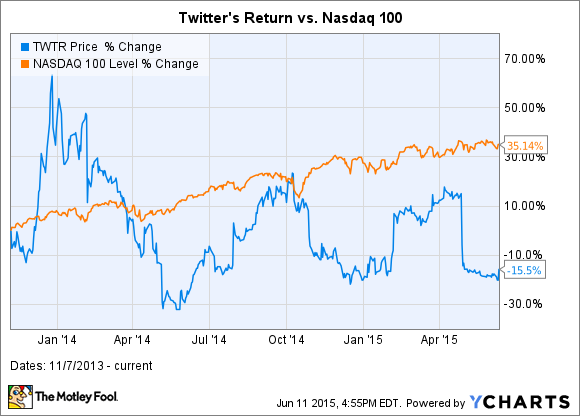 But here's the rub: I'm not sure a change at the top will help Twitter with its big problem -- slowing user growth. According to Sacca, there are three issues that Twitter needs to improve: the service is too hard to use, the act of tweeting is scary, and the service feels lonely. Under Costolo, the company attempted to address the first two issues with an updated onboarding process at the expense of possibly increasing the latter. Throughout Twitter's new onboarding process, there's a focus on recommending new users follow "Very Important Tweeters" -- popular accounts that mostly treat Twitter as a distribution tool rather than a communication platform. The end result is a service that offers a bifurcated Twitter experience, with these power users -- the proverbial 1% who communicate mostly among themselves -- sharing new content on a one-way basis with the 99% who themselves have very few followers. In a weird way, these power users are unknowingly turning off new users and, in the long run, hurting the platform that's been so good to them. And those new users? Well, they close their accounts and go back to Facebook or Instagram or Snapchat or whatever social-media outlet they mesh better with. To be fair to Sacca, he proposes some really cool solutions to solve this loneliness. Those include, among other things, changing the favorite button to something more generic to increase its usage, a possible heart and double heart button to increase interaction, and read receipts when those "Very Important Tweeters" (read: Twitter 1%-ers) have read your tweets and follows. Perhaps favorites and hearts will really drive user growth and timeline views, but it seems unlikely if new users are having problems attracting followers. For the latter, there's a flip side to showing read receipts when a celebrity or VIT-er reads your tweets... you're also aware when a celebrity doesn't read your tweets and mentions, which is entirely more likely than they do. That could potentially be more off-putting than the current arrangement, and discourage privacy and reputation-aware celebs from using the service. In the end, I could be wrong, as it's entirely possible Sacca's recommendations will improve user growth, and stop users from closing accounts; but the next CEO can reward investors in other ways, as well. While there's been no permanent CEO named -- CFO Jack Dorsey will take over after Costolo's July 1 exit -- there are things the next CEO could work on. While user growth was always bound to slow, the company can work on continued monetization of current users, and really work on lowering costs. On a GAAP basis, earnings have been hampered by Twitter's huge stock compensation expenses that amounted to 45% of revenue in fiscal 2014. While it's understandable that Twitter needs to be a competitive employer, especially so close to Silicon Valley, investors should be considered, as well. Twitter's an inherently valuable service; even if user growth continues to slow, investors can be rewarded at these valuations as long as it becomes a better business.